Finding products which are best suited and work for oily skin can be difficult. Espically when it comes to skincare but also make-up, as it tends to not last as long on the face and oils in the skin can cause some make-up to separate. Although this post is not specially about makeup, finding and using skincare products which work can help with longevity to make-up is key, as the skincare is the base for all makeup. Guinot’s range for skincare is known as ‘Purity Skin Care’, and contains effective, deep treatment products which have antibacterial and sebum-regulating active ingredients. They state that it will help with clearing the skin of impurities, faster and longer than any other products. I am going to recommend 3 of my favourites from this range, which I would class as essentials and basics within my skincare routine! Masque Soin Pur Equilibre – It’s important to regularly use facemask, around once a week/twice, to both help and treat the skin. This mask inparticular helps unclog pores whilst exfoliating. It helps even out the skin’s texture and leaves the skin looking and feeling radiant. The mask dries really quickly, and does not have a scent unlike some face masks. 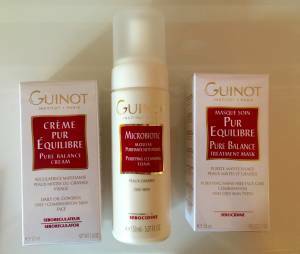 Microbiotic Mousse Visage – Using a cleanser is so important, even if it is not what you initially use to remove makeup, but as a second cleanse this is really good. It is a foam which thoroughly cleanses the skin. It has anti-bacterial properties which help with any breakouts and something which many cleanses don’t have. There are three other products within the range, including a serum, toning lotion and a treatment concealer which all work together to tackle oily skin! If you want any further information or advice just pop into the salon for some help, or to purchase the products!